It's beautiful. I wouldn't paint it either. You can give it some TLC with walnuts and specific furniture polish. That will remove some of the marks, and with the rest I guess you can live, otherwise you wouldn't have bought an old piece. I really like the inner compartments, especially the drawer set. And Jeff is right, the space above it is made for a cowboy hat! Mom is 91 and her heart isn't good. She is suffering from dementia - and she is really suffering because she remembers that she forget and mixes things up. It is hard to see her go....my dad died like blowing out a candle, just like that. I found him and it was not fun but this is worse. But I'm 60 and I've had my mom healthy up to 88 or something so I'm pretty blessed anyhow. How are your parents, Sonja? And your son? Losing a loved one is always terrible and it hurts, no matter how old they are. And watching the gradual decline into dementia is a tough thing. It's good that you know how blessed you (and your mother) have been, but that doesn't keep the hurt away. Sorry about your mum. Dementia is a devastating desease. But a good thing that you already moved her to the caring fascility, it would probably have been worse for her to do it now. My parents are pretty much status quo, thanks. My mum needs massive help from the home care service, but they seem pretty content with the quiet life they now lead. As long as they can stay together at home I'm glad. My son is working as a Real Doctor for the first time this summer! He still has one more year to study, but can work under supervision. And Jeff is right, the space above it is made for a cowboy hat! I can just see my Western shirts hanging in the large space, with my boots lined up in a row underneath them! 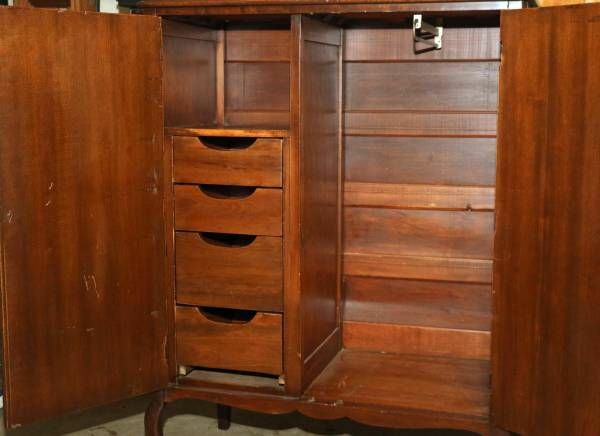 Everybody should have a Brokie armoire. I sometimes miss a place where I can post "Hi to everyone", todays sad or joyful events, what the cat did, just peices of everyday life....a bit like The Diner on DFC. Maybe I have missed something but in that case, show me!! If this is totaly out of order, please feel free to say so. Dementia is such a cruel desease. I´m so sorry your family has to go through this. I haven´t been around much either lately. I´ve been busy working, trying to move up a little but it´s taking a long time. I feel though that I´ve allowed work to become too important in my life and that I need to find my way back to other things that matters to me. Work´s not everything, after all. Vacation is coming up in about a month, so that´s something to look forward to. It was a wonderful trip to Canada and I got to spend time with lovely people. I had a long and plesant walk with Crissi to Campsite 1. A couple of days in NY with Sophia, oh we had good times! Met Meryl and John for the first time, Chuck also. Fell in love with the High line!! And fell in love with NY! !I'll be back!